For simplified installation of the HeatTech mat, the fiber mesh backing can be cut as needed (without cutting the wire) and re-adhered to the flooring surface eliminating the process of constant re-stapling of the mesh. 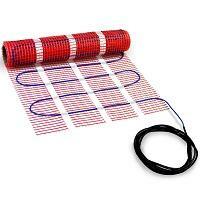 A single 10ft long cold lead simplifies the wiring and does not require consideration for running a return wire. HeatTech underfloor heating system is designed for use in conjunction with a floor sensing, programmable line voltage thermostat, such as TH115-AF series models by Honeywell.